So your mantel should be all decked out by now! 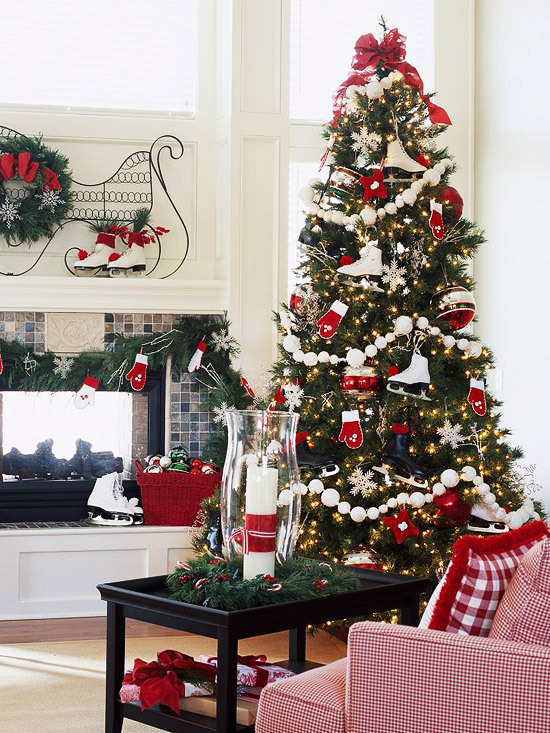 If not, check out some of the inspiration from yesterday’s post on Merry Mantels. 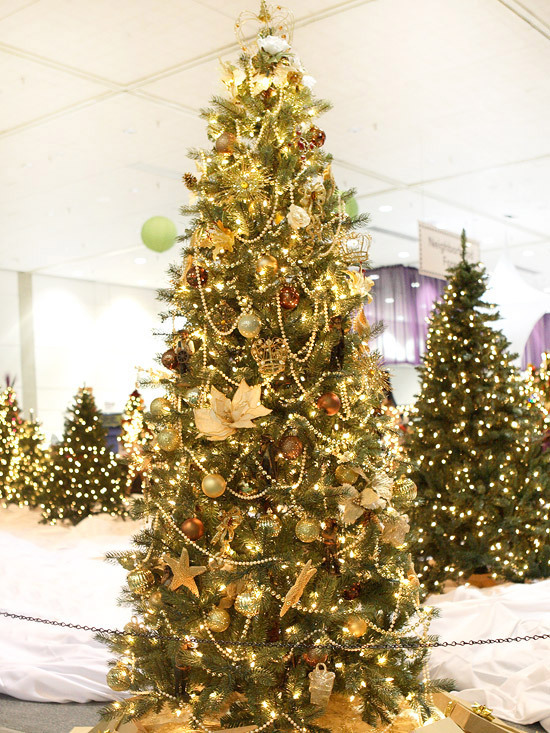 Today we are going to talk about the next biggest item in Christmas decorating – a Trimmed Tree! Now we could debate the real vs. artificial issue here, but what we are talking about is the decorations. I will mention what we do and why. Since getting married we have always had an artificial tree. We saved up and bought it the day after Christmas our first Christmas and got a really nice one. I love that we spent $60 one time and have used it for now 8 years ($7.50/yr. is not bad and it goes down even more each year.) It doesn’t get needles or sap all over the floor and isn’t droopy by the time Christmas gets here. It was pre-lit when we bought it, but each year a portion has stopped working so we have had to add lights. And, no, it doesn’t “smell like Christmas” but my MIL is allergic anyways – hmmm…maybe a real tree isn’t a bad idea – just kidding, I really do love my in-laws And honestly, I would love to have the storage space that the artificial tree takes up but I am too cheap to spend $30+ each year on a real one. The biggest factors in our choice is cost and mess – so artificial works for us! Would love to hear what you do and why in the comments. So no matter if you have a real or artificial tree you need something on it! But let’s talk about the most traditional green tree. 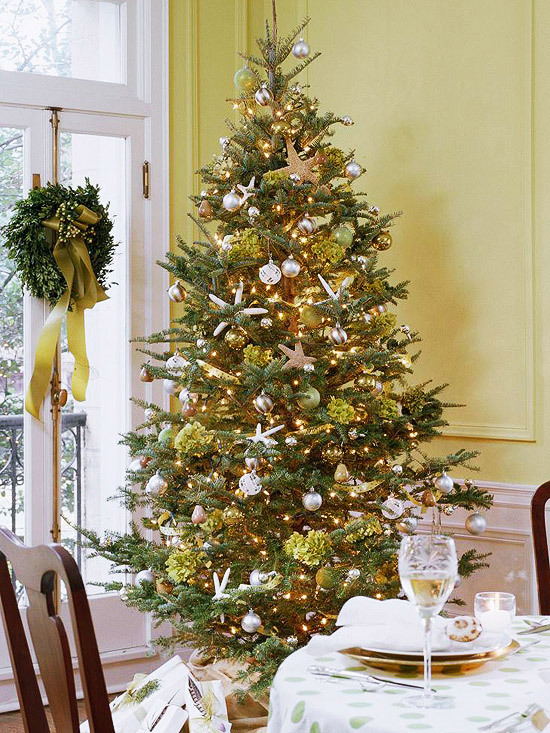 Once you have your lights on you can decide if you want you tree to have a color theme or a theme among the ornaments. I love sticking to a theme within my colors like this red, silver and gold tree. Or one in red and white with mittens and ice skates as the theme. Trees can be decorated with non-traditional items like this sparkling starfish tree. This woodsy tree is so pretty too! 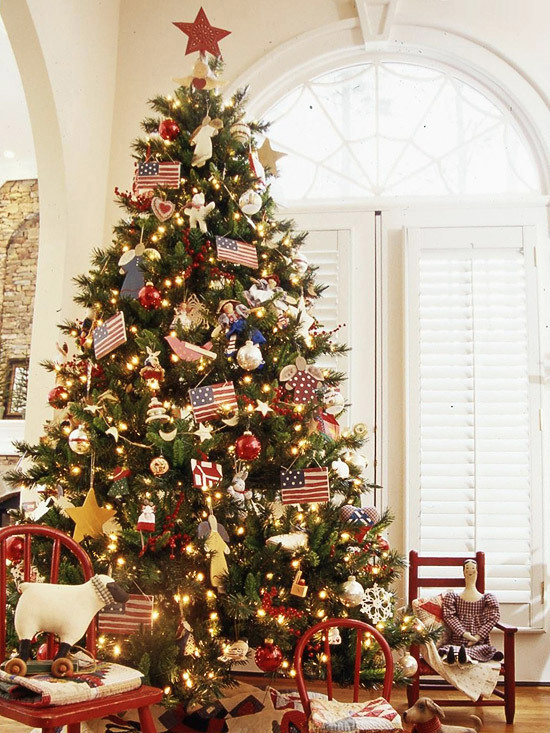 Or maybe you have a tree decorated with ornaments that you have collected from family vacations, homemade ornaments your children have made – those can be just as gorgeous! 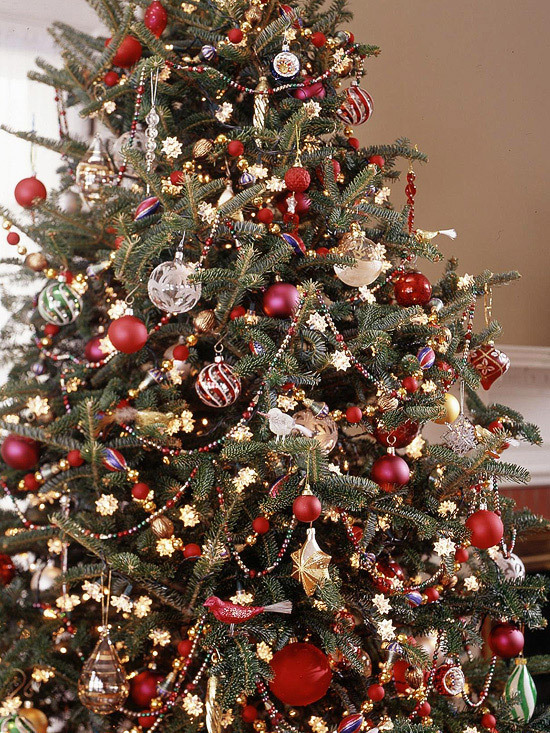 Maybe pick a series of ornaments like red or gold balls and repeat them throughout the random ornaments to create a sense of balance and uniformity. Don’t forget to add some natural elements. I have a very traditional tree decorated in gold, burgundy, ribbon… but I still add in pinecones, faux flowers, berries and more to keep it balanced. Peek of last year’s tree – finished pictures next week! Just whatever you do, please don’t do this, ok? 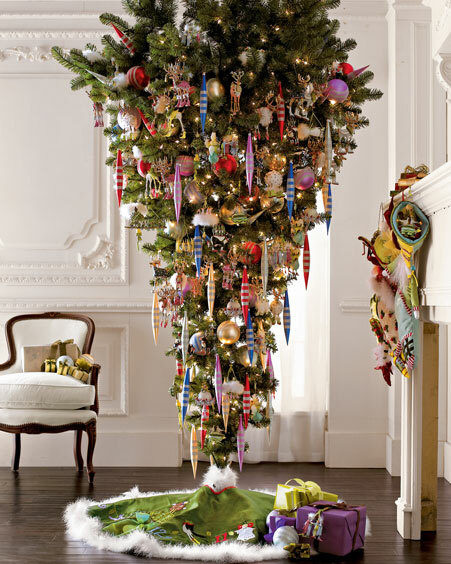 I know it might give you some more room for presents underneath, but I would get a crick in my neck trying to turn my head to see it the right way! 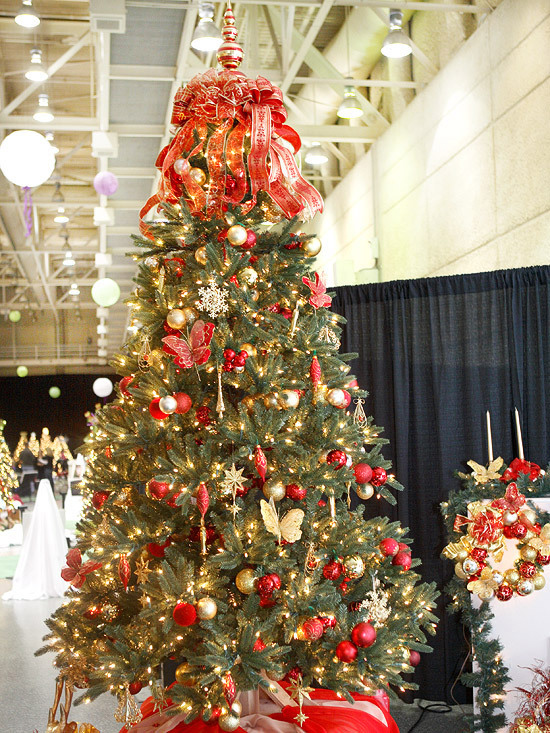 Do you do a real or artificial tree? 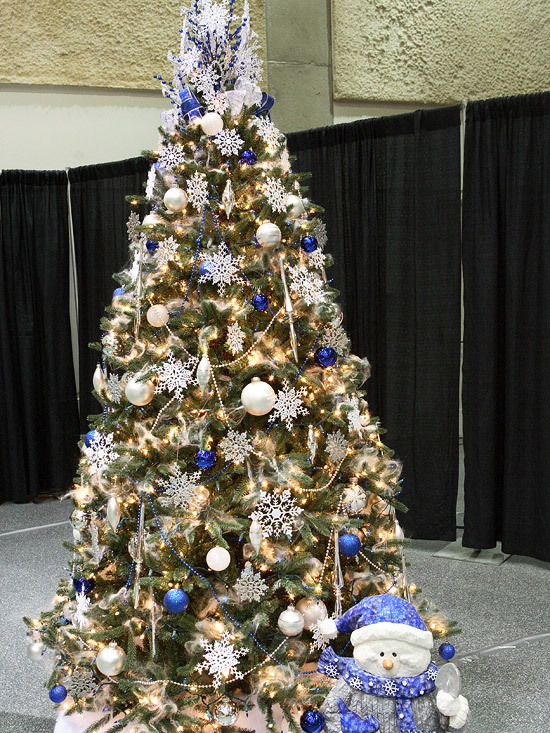 What is your favorite theme or color to use to decorate your Christmas tree? What a beautiful style you have! Thank you for sharing with us. May God bless your Christmas season as you focus on our Lord and His wonderful gift. I have a small little artificial tree. I’ve not seen a real tree here before. I don’t know if people use them here or not. I love white lights, red bows, and rustic ornaments. This year I added silver to the tree as well. I love it!! Can’t wait to see your tree. ughhh.. I can’t imagine removing them all 🙁 This year NONE of the prelit lights work. 🙁 I think I have 10 strands or so on there. and how about after wrestling putting them all on the other night a strand in the MIDDLE goes out today and 1/2 the tree is dark – grrrrr….. told David it might be time to think about buying a new one. Probably not this year though. We have one artificial tree, and I’ve done different colors with it – one year was blue & silver, another was red & gold, then purple & silver. We’ve gradually added to our ornament collection. I love the old frame with the chicken wire that is such a great idea with so many uses! 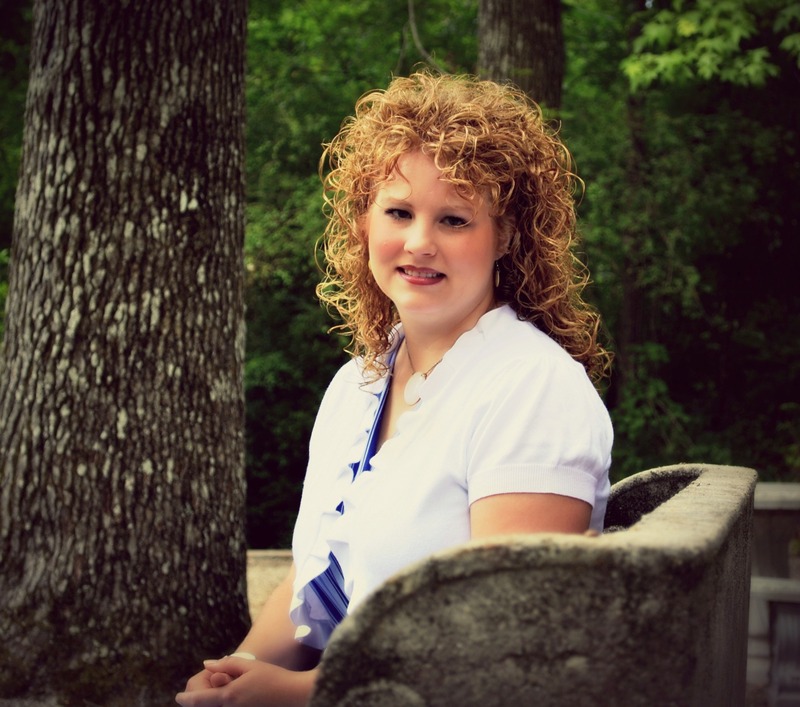 I found your blog via Gussy and just love it. Happy holidays! chicken wire is a fun thing.